New Delhi: Agriculture & Farmers Welfare Minister Radha Mohan Singh said that to bring prosperity in the field of agriculture measues are being taken to boost the production of the smallholdings, reduce production costs and maintain the productivity. 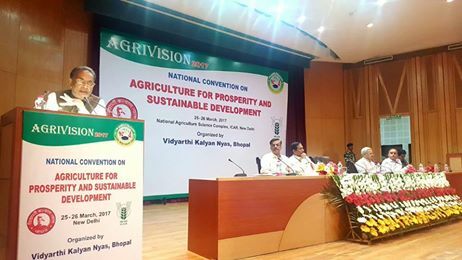 The Minister was speaking at a seminar on Agriculture for Prosperity and Sustainable Development organised by VidyarthiKalyanNyas, Bhopal and Indian Council of Agricultural Research, Pusa, New Delhi. Dr. TrilochanMohapatra, Director IARI – KrishiJagran; Dr. A.K.Singh, Deputy Director General (Agricultural Extension); Dr. J. Kumar, Dean College of Agriculture, Pantnagar; N.C. Gautam Vice-Chancellor MGCGV, Chitrakoot; and Prof. K.M.L. Pathak, Vice Chancellor, DUVASU, Mathura were also present on the occasion. The Minister said that the biggest challenge for the agricultural sector is to make smallholdings profitable and engage rural youth in agriculture. He added that the task is difficult but not impossible. He also said that work is going on to provide small farmers distinct technological option so that they can choose as per the resources available to them. He said that to achieve that, it is important that agricultural scientists should develop different techniques as per the requirement of different regions and KrishiVigyanKendras and advertising network should make them available to the farmers without delay. He said that it is important to implement soil health card properly. We should build awareness among farmers about the right use of fertilisers so that they can increase production while maintaining the fertility of the soil. So far only 6 crore soil cards have been issued against the target of 11 crores. He said the government launched Pradhan MantriKrishiSichaiYojana in 2015 with an aim to provide water to every farm and improve water use efficiency ‘More crop per drop’. Proper management of rain and harvested water will play an important role in doubling farmer’s income. We are promoting integrated farming system so that farmers can yield higher income through horticulture, livestock, agroforestry and other composite farming systems. Indian Institute of Farming Systems Research, Meerut has developed 38 integrated farming systems for 23 states. In the current financial year, the government has sanctioned Rs. 3crore for the exhibition of integrated farming in 100 KrishiVigyanKendras (KVK). Each KVK will get Rs. 3 lakh and utilise the fund to train farmers so that they can adopt integrated farming model to increase their income. The Minister said that agriculture education and agriculture research plays an important role in the growth of agriculture sector. In the last two years, Indian Agriculture Research Council (ICAR) has developed 441 improved species of food grains as well as horticulture crops and 13478 tonesof genetic seeds of various crops. The institutes under ICAR have developed 53 agricultural equipment that will benefit farmers. ICAR has also registered nine new livestock and poultry species. He said that the government has submitted a guideline for the establishment of Central Agriculture University to improve the quality of agriculture education. The Rajendra Prasad Central Agricultural University in Bihar has been elevated to the status of Central Agriculture University. Four new degree colleges have been established under Rani Lakshmi Bai Central Agricultural University to promote farming in Bundelkhand region. Six new degree colleges have been set up under Central Agricultural University, Imphal in the Northeast region of the country. Financial aid has been given to the government of Andhra Pradesh to establish Agriculture University, while Telangana and Haryana state governments are given funds to set up horticulture universities. In the last two years goverment has sanctioned 40 percent extra funds for the agricultural universities in the states. He said that on the recommendations of the 5th Dean’s Committee, the curriculums of agriculture courses have been improvised. Last year all agriculture based graduation courses were altered into the professional one. To motivate students for higher education in agriculture, junior/senior scholarships and National Talent Scholarships have been increased. At the graduate level, it has been increased to Rs.2000 from Rs.1000 per month. The government has started Netaji Subhas – ICAR International Fellowships for 30 students who will get a scholarship of $2000 per month. READY (Rural Entrepreneurship Awareness Development Yojana) programme has been initiated. Under this, the scholarship of Rs.1000 per month is increased to Rs.3000 per month. All the initiatives have led to a 17 percent increase in the admission into the colleges under ICAR.